Sapphires are one of the most precious, historically important and valuable gemstones. Sapphires come in every color except for red. (A red sapphire is called a "ruby") Sapphires are valued for their strong luster (ability to reflect light like a mirror), and hardness: they are the next hardest stones after diamonds. This means they can be worn in rings and bracelets for centuries with a low chance of being scratched. 1. Color: The color of a sapphire is one of the strongest determinants of its value. Blue sapphires come in a range of shades. The brightest,most intense are the most valuable. Yellow Sapphires, also known as Fancy Sapphires are bright gemstones that range in color from a "Light Buttery Yellow", a "Medium Buttery Yellow" or "Light Canary Yellow", a "Rich Buttery Yellow" or "Canary Yellow", to a "Rich Canary Yellow". 2. Clarity: Clarity is the other most important factor in determining the value of a sapphire. A high quality sapphire must be free from visible inclusions (internal imperfections). 3. Carat Weight: Large, quality sapphires are rare and expensive. For the same color, clarity and cut, the larger the sapphire, the more valuable it is. 4. Cut: Most sapphires available in jewelry are quite poorly cut. Perfectly cut sapphires are usually only available in the finest jewelry and their price reflects a premium. Learn how to tell the difference between a poor cut and a quality cut before buying your sapphire. 6. Treatments, Synthetics and Imitations: Sapphires are often synthesized and immitated by other substances. In addition, almost all natural sapphires undergo some kind of treatment process. Learn about these before sapphire shopping. 7. Astrology Significance: Sapphire has been revered for centuries all over the world. It is rich with symbolism and special healing properties. Learn more about sapphire Jyotish Significance to see if it''s something you relate to. Most Valuable Sapphire The most valuable sapphire has an intense and beautiful color (cornflower blue and padparascha are the most valued colors), a perfect cut (very difficult to find in sapphire), a large size (over 3 carats), and good clarity (sapphires are rarely perfectly clear). 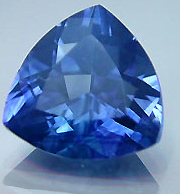 Lower Value: This sapphire is the least valuable type of sapphire. It is cut en cabochon which shows it is of inferior clarity. The color is much too dark and dull. And it is not very large (about 1 carat). Such a sapphire can be bought for under $50. Low Value: Sapphires like this are common in low range fine jewelry. The color and clarity are better than the previous one. However, the color is still too dark. It is very small (about 1/2 carat) and very poor cut (too shallow). Medium Value: This kind of sapphire is what you usually find in fine jewelry. 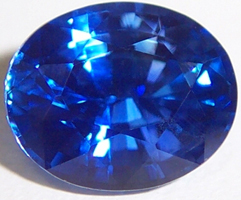 It is larger than average (about 2 carats), of very good clarity for a sapphire; the cut is decent and the color is attractive (though still darker than ideal). High Value: Sapphires like this are very hard to find, let alone afford. 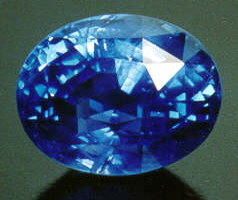 This sapphire is extremely valuable mostly because of its bright "cornflower blue" color and its unusually good clarity. The cut is also good and it is large (over 5 carats). 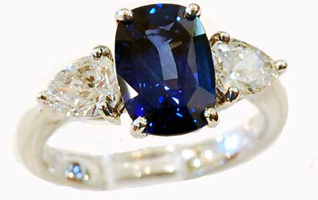 A sapphire like this will cost several thousands of dollars. Here are some more pictures of sapphires with a more detailed analysis. 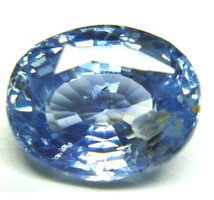 This is an example of a sapphire of very poor clarity which detracts from its value: the stone is not transparent and does not reflect light or sparkle. It does however have an excellent color and it is very large. This stone would be worth very little if it weren''t for its color. 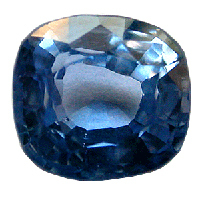 This sapphire is of very poor clarity : we cannot see into the stone, nor is any light reflected from the bottom facets. 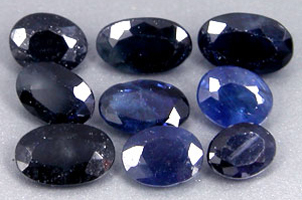 In addtition, the color is very dark blue: the color that is the most common and least valuable in blue sapphire. Its poor clarity and color make this stone very inexpensive. 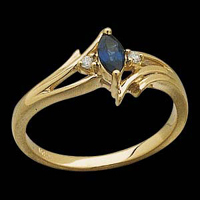 The sapphire in this ring is very typical of what you find in most jewelry. Its clarity is good enough so that we can see the sparkle from the bottom facets (though there are several large inclusions). The color is darker than is ideal. The cut is also not correctly proportioned: some light escapes through the bottom and the facets are strangely shaped (the top or "table" facet should be wider to let in more light.) This sapphire is of good quality, but nothing exceptional. This sapphire is a lovely light blue color: probably its most valuable characteristic. The stone is clear: we can see into most of the stone and see a sparkle. However there are many large inclusions that also detract from its value (large fractures toward the bottom and something brown in the stone to the right). However the worst part of this stone is its cut. The cut is very sloppy: the facets are uneven and misproportioned. What an amazing sapphire! What makes it amazing is its ideal blue color. This is commonly called "cornflower blue" and it is bright and deep. The clarity is not perfect (if you look near the top you can see the lines and fractures), however natural sapphires are usually with some inclusions. Plenty of light and sparkle reach the eyes despite the inclusions. The cut is slightly disproportionate but not so much that large quantities of light are lost. Here is another very high quality blue sapphire. It''s clarity is outstanding-so clear it looks synthetic. The cut is excellent: facets are even and the stone is well proportioned. The color is also a very nice blue. 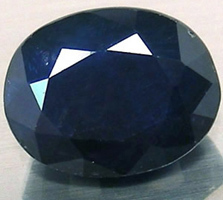 If you see a sapphire like this in your price range, buy it. 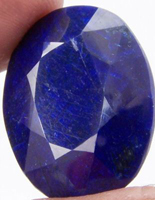 An example of a badly cut sapphire. This cut is terrible. The obvious problem is that the facets are very uneven. The "table" facet (top flat facet) is unevenly shaped and way too small. It is also a "fish eye" meaning the stone was cut to be too wide and too shallow, thus letting light escape through the bottom. We can see through it where we should see sparkle. Otherwise, the color is okay and the clarity is good. However the very poor cut of this stone makes it considerably less valuable. Wow! The color and clarity of this blue sapphire make it one of the best you could ever buy. The cut is not perfect (facets do not meet nicely at the corners), but it still sparkles and reflects light nicely. This stone is exquisite. As low quality as it gets. These sapphires are very small and of terrible clarity. They are nearly opaque: we almost can''t see into them. Their cuts are much too shallow, almost like faceted disks. And finally, the color of most of them is so dark, it''s almost black. Here is a fine yellow sapphire. It''s greatest asset is its intense yellow color. It is also fairly clear (only small inclusions). The cut is alright: we see light reflected and sparkle. However, the facets are irregular and some light escapes through the very tip. In general, this is a purchase worthy yellow sapphire. 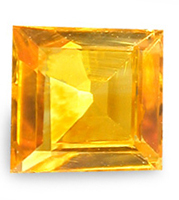 This yellow sapphire has a rare, beautiful and valuable golden color. Its clarity is less than ideal: we can see small specks and streaks throughout the stone. The cut ("princess" shape) is a bit uneven and sloppy but generally, this is a fine yellow sapphire. what will b the price of 2carat sapphire for men...? please tell me the rate of good quality & effectable neelam 7-8 carat. I have 2.5 carat blue sapphire Its having shiny layer and it looks like blue ink bottle i want to know its quality can u guide me how can i post the picture of it so that i may know its value. need an 8 carat yellow pukhraj. pls advice price,etc. if possible jhirum should be less. thanks n kindly email.